If you love the look of the lampwork beads as much as I do, but lack the skills and tools needed to make them, you will definitely appreciate this clever technique. I will teach you how to make the beads shown here using polymer clay, resin, and one more material, which I will reveal in the tutorial. This third material is cheap and can be found in any craft store. 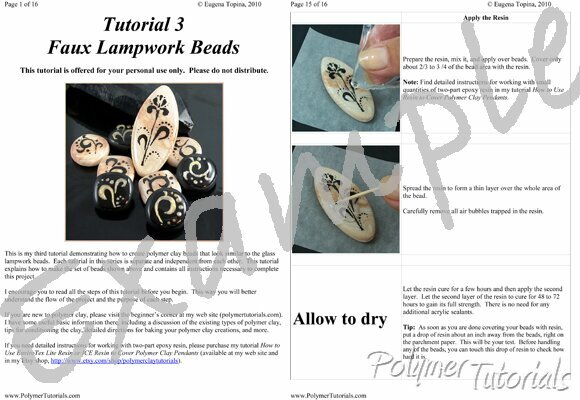 The tutorial contains detailed instructions explaining how to shape the beads with the subtle patterns on them and how to decorate the beads with swirls and an iris motif. A twelve-step scheme explaining how to create the iris motif. Once you master these steps, you will be able to make any beads you want! This tutorial teaches a new technique, which you will be able to apply for an endless number of your own designs. The last three pictures on this page demonstrate a few technique variations. Place a mouse over the small pictures to see them enlarged. Wonderful ideas and excellent tutorials! Thank you so much f ..